I deliberately try to avoid the news for this very reason, Diane. I always fail and find myself being told all sorts I didn’t need to know about the world, aliens and stuff. You like aliens don’t you? 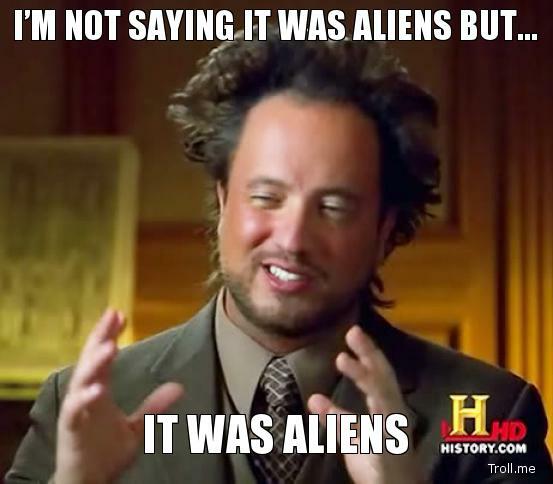 I wonder who’s the celebrity having “fun” with aliens..hehehe. Ehehehe…well…strangely I always used to think: Why do we have this morbid fascination of celebrities..it’s not like they were aliens or something! LOL! You do realize that since we both agree on this, that makes it true. Call the tabloids! Wait… does that make me an alien…? Ooo….wow…gosh, does that make me famous for knowing an alien? Oh, my – that is truly scary! But maybe she really needed to believe that at the time… I wonder if she still does? BTW, saw the response about book 7 (along with more?) I’m salivating at the mere thought of more “Spy” stories. I am anxiously waiting. Bless you. Wait, the Brazilian National Soccer Team?!? 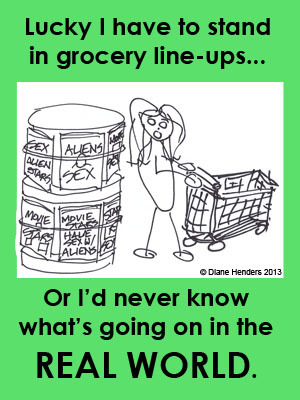 I think I’d rather read some of the trash in the checkout line than what is actually happening in the world. At least it’s a laugh. Well that’s certainly how I stay on top of the news. I mean, seriously, what do I care about economic policy? The important thing is to know who’s boinking whom this week. Isn’t that the truth! I wind up standing and reading all the nonsense titles and then start laughing. Recently another lady looked at me like I was the one that was crazy. Really? Then you obviously didn’t hear that Elvis was spotted in a Walmart in Calgary! You really need to get our more. Honestly, I don’t know how I lived without such critical information!